Today’s topic: All About Audio freebie — aka top ten audiobooks you should listen to, 10 books I want to listen to on audio,10 bands you should check out, 10 podcasts you should be listening to, 10 of my all time favorite albums, 10 songs I love, really whatever you can come up with. Undisclosed: The State vs. Joey Watkins. Undisclosed is hosted by Rabia Chaudry, the woman who brought Adnan Syed’s story to Sarah Koenig. The team has taken on a new case, the case of Joey Watkins, who was convicted on murder on very little evidence. It’s a very interesting case. Truth & Justice. Another podcast that spawned after the first season of Serial, and hosted by Bob Ruff, T&J is now tackling two cases in the incredibly corrupt Tyler, Texas area. Bob also gives us updates on Adnan’s case as they arise. Bob is an incredibly compassionate man and is a good storyteller. Crime Writers On. A Serial spin-off. Notice a trend?? CWO covers Serial, other podcasts, pop culture, fiction, true crime, you name it. Very entertaining podcast. They spent a majority of a recent episode talking about Stranger Things, so I love them even more now. Serial. Obviously, my love of podcasts started from Serial. While I didn’t love season 2 as much as season 1, I still love Sarah’s storytelling style. Real Crime Profile. Hosted by Jim Clemente, former FBI Profiler, Laura Richards, former Scotland Yard profiler and advocate for domestic abuse victims, RCP is a deep dive into crimes. They have discussed cases like OJ Simpson, Oscar Pistorius and now JonBenet Ramsey. Incredibly interesting. Breakdown. This podcast is a little different in that it only airs when there is new details about the cases they are covering. They covered the case of Justin Chapman, who was accused of murdering his neighbor in a fire and Justin Harris, who is being tried for murder, after leaving his young son in a hot car all day, where he later died. Not as polished as other podcasts, but the content is very interesting. Criminal. Hosted by Phoebe Judge, who has a Sarah Koenig type voice, Criminal is short stories told about more obscure crimes (stealing wood from protected trees, blackmarket bourbon). They are all short stories but incredibly interesting. Actual Innocence. 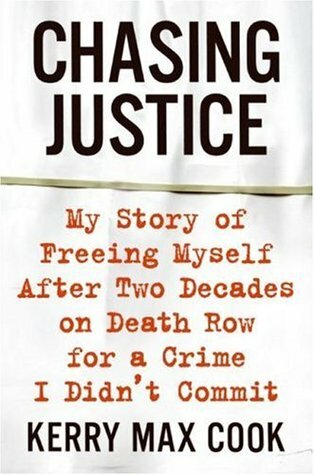 Stories of people convicted then released from jail after being proven innocent. A newer podcast, but it’s told by the person who did the jail time, with occasional narration by the host. Limetown. The only non-crime podcast I listen to. This is so outside my normal realm, but I love this podcast. In fact, at first, I didn’t know if it was real or fiction. Told beautifully by it’s fictional host, it’s a great mystery. Can’t wait for the next season. Which podcasts do you like? Always looking for true crime recs (though Sword & Scale is too dark for me). Kerry Max Cook was born in Germany, & spent much of his youth on army bases. He returned to the US with his family in 1972 to live in Texas. In 1977, at the age of 19, he was arrested & wrongly convicted of capital murder, a crime for which he would spend the next 20 years on death row, only to be cleared of all charges in 1999. I’m going to say right off the bat that I only read this book because of the Truth & Justice podcast. Bob (the host) asked us to read it relating to a case he’ll be discussing. I hope the case we’re discussing is good because this book was BORING. One of the witnesses against Kerry claimed he was a homosexual and a pervert. Many people claimed this. Mr. Cook NEVER addressed these claims. Was he homosexual? It was a question never answered. Doyle Wayne. Kerry’s brother, who he “spoke” to frequently. I don’t know if there was mental illness there, but something was off and it was never addressed. Kerry’s alibi. He maintained his innocence but NEVER said what he was doing or where he was at the time of the murder. This book was so detail heavy. I skipped through a lot of detail because it was both cumbersome and boring. There were so many “characters” that it was hard to keep up with it and very confusing. In the end, DNA evidence proved that Kerry was not the killer, and it was the person he thought it was all along. I would skip this book.